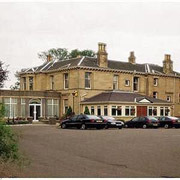 Set in landscaped gardens and surrounded by golf courses, with the look and feel of a country house hotel, on the outskirts of Grangemouth and Falkirk. With easy access to the motorway for Stirling, Glasgow and Edinburgh, we are in the ideal location in for exploring central Scotland. Grangemouth and Falkirk business districts are 5 minutes away, an easy commute for business travellers. Edinburgh Airport is only 20 minutes away, with Glasgow Airport just a 45 minute drive. We are a 36-bedroomed 4 star hotel. Our rooms are well equipped with all of the amenities you would expect - with complimentary wi-fi throughout. The 6 rooms in the manor house have recently been upgraded to 5 Star standard offering the very finest luxury stay in the area. En-suite, good-sized double bedrooms - all with colour television and satellite connections, direct dial telephone, work areas, trouser press, iron and ironing board, hairdryer and hospitality tray. We offer two specially adapted rooms, adjoining rooms and family rooms. In the original house we offer six 5 star luxury and recently upgraded feature rooms for you, with many unusual and traditional features, these rooms are larger and can be ideal for that special occasion. We also offer a variety of short break packages ranging from golf, theatre, local attractions or just a quiet mini break. We have the knowledge to organise a fun-filled break for you! Have a look at the Special Offers page for our current package deals, or call us directly on 01324 474 836 and speak to our Reception team.